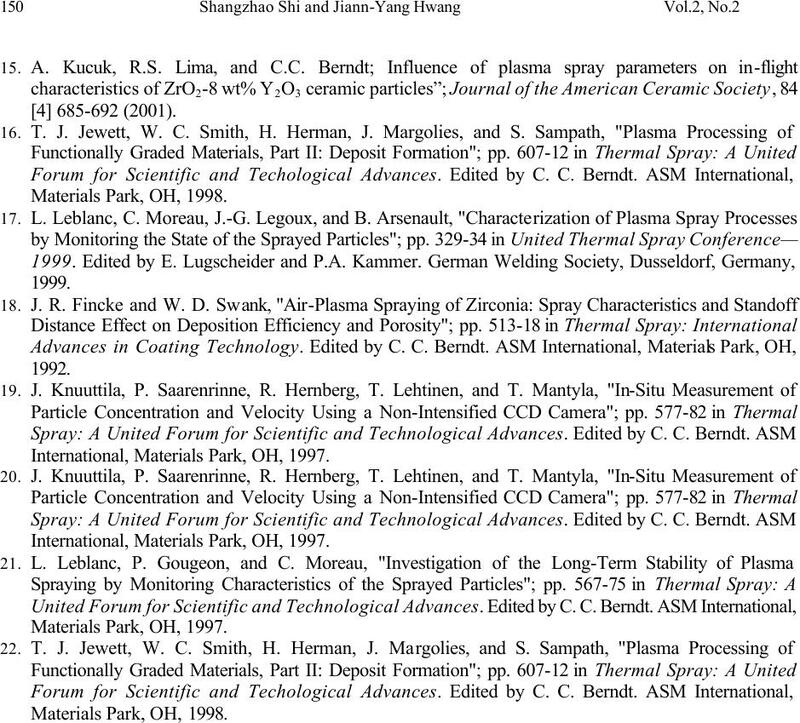 light of the plasma spray forming process. 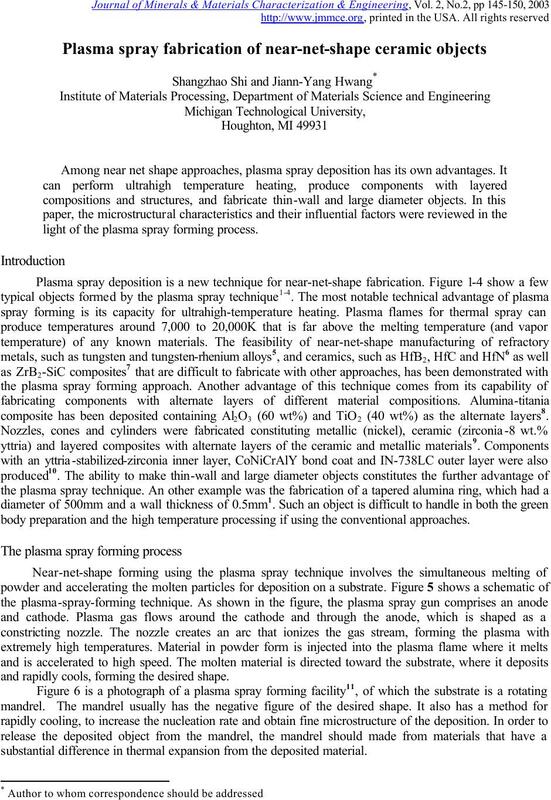 body preparation and the high temperature processing if using the conventional approaches. and rapidly cools, forming the desired shape. 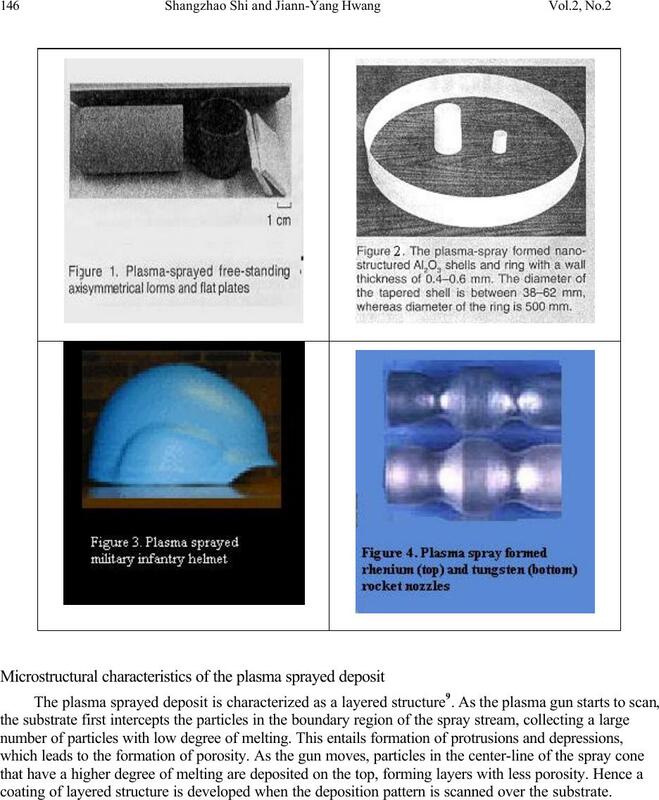 substantial difference in thermal expansion from the deposited material. coating of layered structure is developed when the deposition pattern is scanned over the substrate. 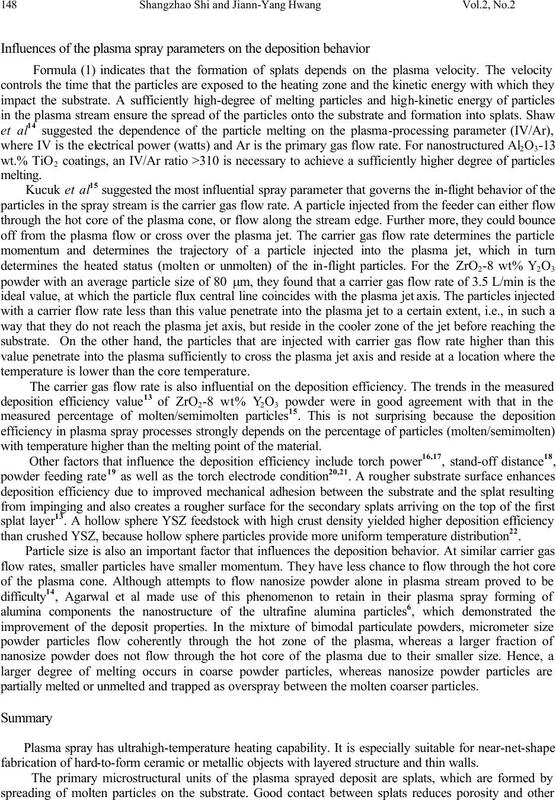 experimental result was still in good agreement with the calculation from this formula. deteriorated the strength to a great extent. nanosize alumina agglomerates (40 wt.%) into commercial alumina powders (15-45µm, 60 wt.%). Microscopic images showed fully melted coarse alumina grains surrounded by ultrafine grain structure. is higher than conventional alumina coatings in as-sprayed condition. temperature is lower than the core temperature. with temperature higher than the melting point of the material. 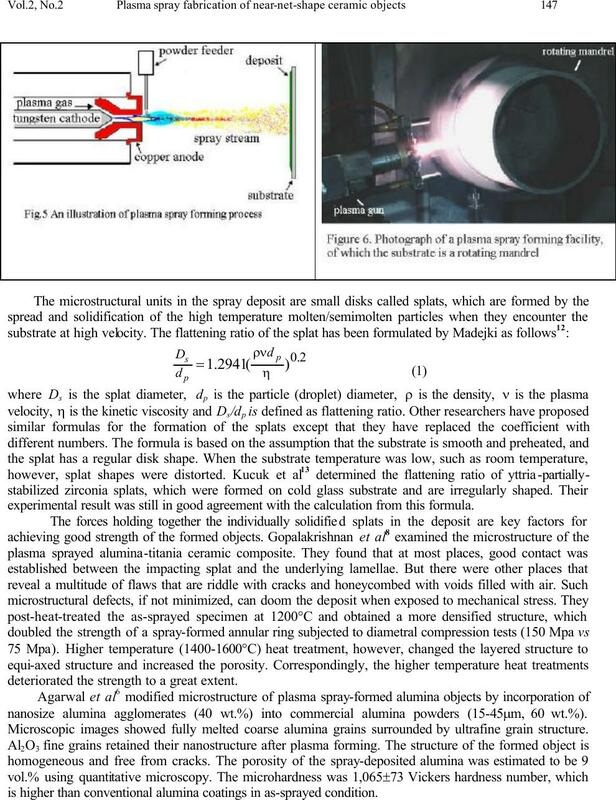 partially melted or unmelted and trapped as overspray between the molten coarser particles. fabrication of hard-to-form ceramic or metallic objects with layered structure and thin walls. the stream centerline cannot be melted and cannot form the desired splats. flow rate higher than this value will drive the powder over and across the center zone. Therm. Spray Conf., 457-61 (1994). Processing Technology, 135 [2-3] 228-234 (2003). 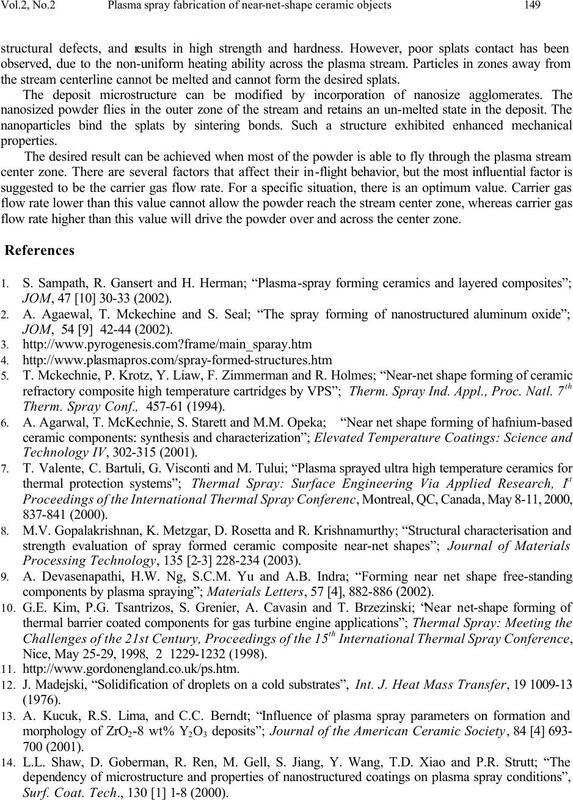 components by plasma spraying”; Materials Letters, 57 , 882-886 (2002). Nice, May 25-29, 1998, 2 1229-1232 (1998). Surf. Coat. Tech., 130  1-8 (2000). International, Materials Park, OH, 1997.